Cataloging long neglected video is a good way to fend off cabin fever. I relive dives and get some work done at the same time. 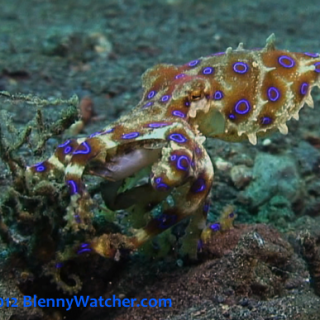 I’m up to November 2008, Papua New Guinea – a rare day, with everything that for us, made the perfect dive: a shallow, mucky bay, with outflow from a river; warm water; no current – and – permission from the dive operator to stay down as long as we wanted! Unfortunately, the site had been ravaged the month before by 40 centimeters of rainfall, 25 more than the norm for this time of year. A friend from another boat, a frequent visitor, told us that he had never seen the site with so few of the expected muck critters. Perhaps the extra fresh water had driven them away to deeper waters. It turned out to be a bonanza for us. 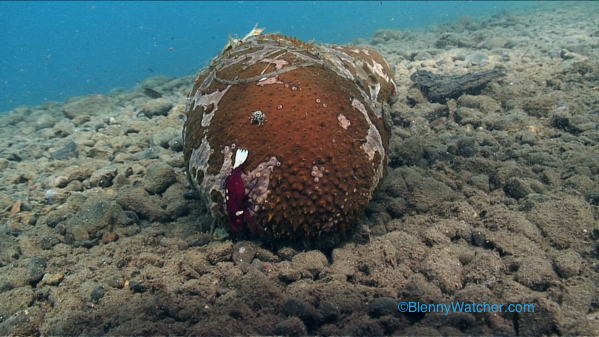 The remaining sea cucumbers and larger nudibranchs scattered over the slope were loaded with commensal shrimps and crabs and one extra special treat at the end of the dive. 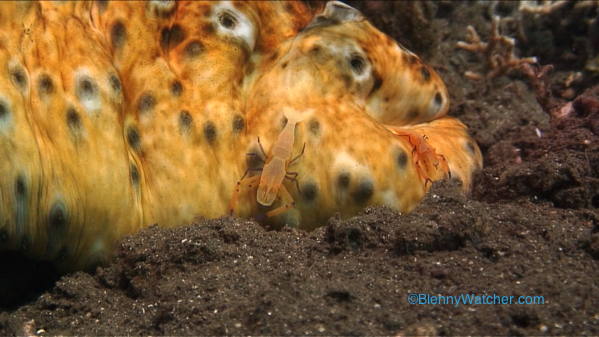 Emperor shrimp (Periclimenes imperator) live on several species of holothurians. 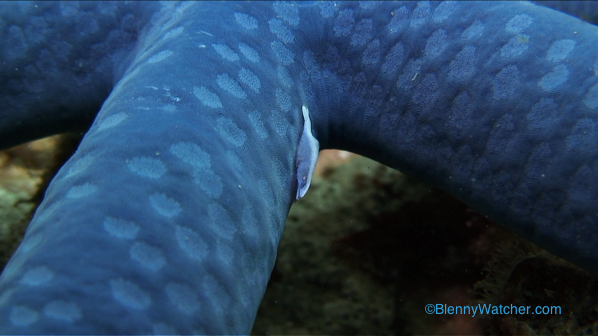 They can often be seen hanging upside down, feeding from the bottom as the sea cucumber moves along slowly. 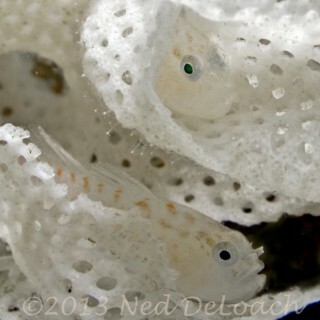 Sometimes they are spooked by our presence and scramble under the host for protection. 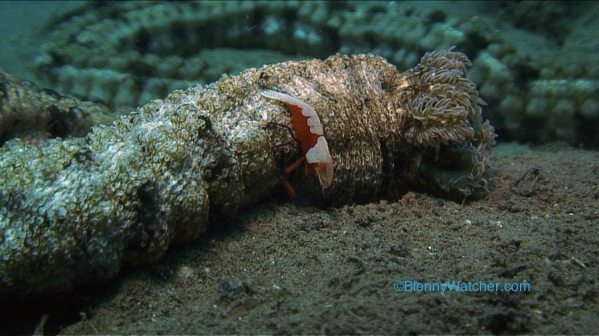 Their relationship is commensalistic, meaning the shrimp benefits by receiving things like protection, transportation or food and the sea cucumber is unaffected. 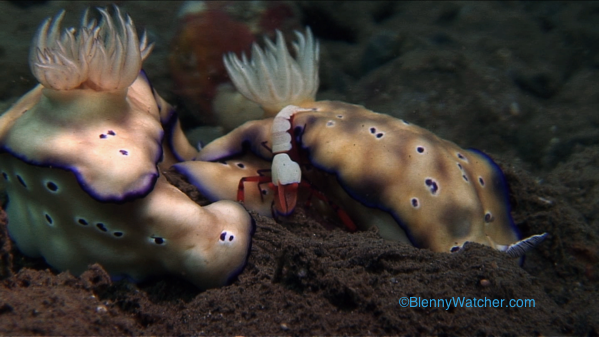 Emperor shrimp are also sometimes found on larger nudibranchs, like these Risbecia tryoni. 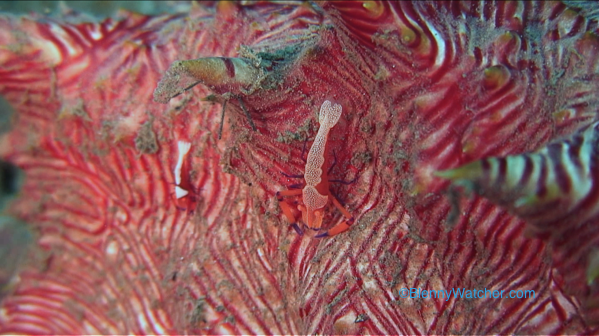 Something I recently read mentioned that the shrimp might assist the nudibranch by removing parasites – not impossible I suppose, since nudibranchs bearing parasitic copepods have been reported by others. If that were the case then I guess the symbiotic relationship would be mutualistic, because both parties benefit. 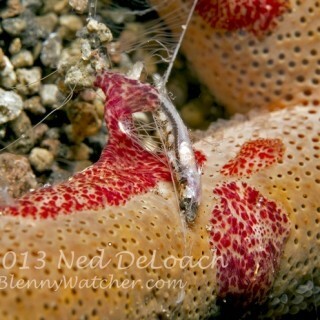 The shrimp on this sea star is a different species, Periclimenes soror. 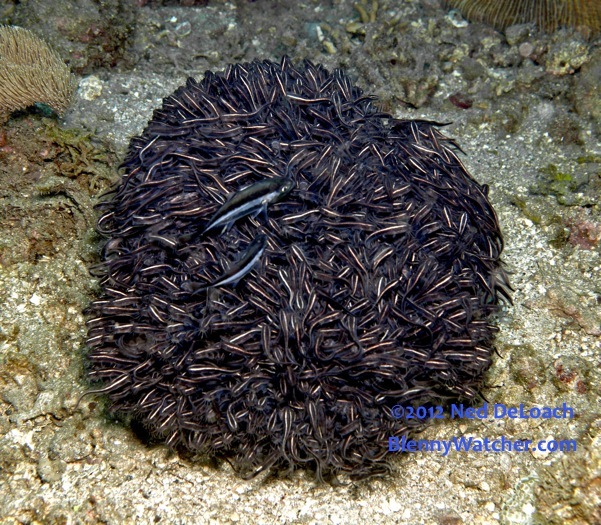 They come in a variety of colors, often matching their sea star hosts, here, the Blue Sea Star, Linckia laevigata. Wonderful behavior caught by you Anna. Very good documentation. You have been keeping the good stuff under wraps for years! Thanks Rudy! I keep forgetting about all the fun things I’ve seen. Need to dig into the files and share them!